Creating a Request for Proposal can be a daunting task I you don't have a guide to walk you through it. After all, all sorts of vendors will be answering with the hope of landing the deal. But what should the RFP include? What information should I require from the responders? Just technical? What about financial and organizational? What kind of communication techniques should I employ? Or in short, how do I create a RFP (Request for Proposal)? Download this professional and proven template to create requests for proposals. ...... After all, all sorts of vendors will be answering with the hope of landing the deal. But what should the RFP include? What information should I require from the responders? Just technical? What about financial and organizational? What kind of communication techniques should I employ? 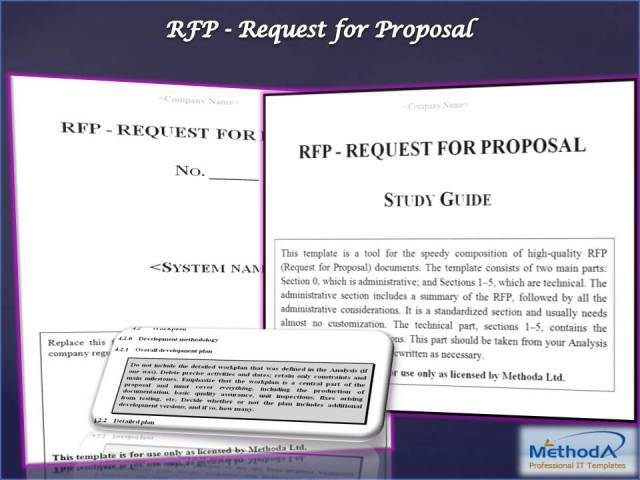 Or in short, how do I create a RFP (Request for Proposal)? Well, no need to fret. This template for creating your RFP makes it easy to produce a professional RFP. In addition, a Study version of the template is supplied to walk you through the issues with helpful hints as you go. Download this professional and proven template to create requests for proposals that are well-designed, well-organized and easy to read and reply to. Qweas is providing links to Request for Proposal - RFP 3.00 as a courtesy, and makes no representations regarding Request for Proposal - RFP or any other applications or any information related thereto. Any questions, complaints or claims regarding this application Request for Proposal - RFP 3.00 must be directed to the appropriate software vendor. You may click the publisher link of Request for Proposal - RFP on the top of this page to get more details about the vendor.